Background: Glatiramer acetate (GA) and interferon-beta (IFN-β) are disease-modifying therapies (DMTs) for multiple sclerosis that are administered through subcutaneous (SC) or intramuscular (IM) injections. Skin reactions associated with DMTs are common and may influence patient's health-related quality of life (QoL). 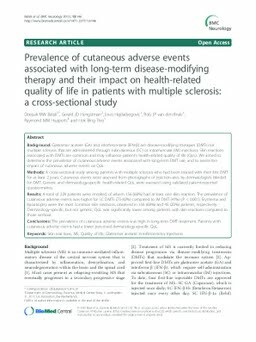 We aimed to determine the prevalence of cutaneous adverse events associated with long-term DMT use, and to assess the impact of cutaneous adverse events on QoL. Methods: A cross-sectional study among patients with multiple sclerosis who had been treated with their first DMT for at least 2 years. Cutaneous events were assessed from photographs of injection-sites by dermatologists blinded for DMT. Generic and dermatology-specific health-related QoL were assessed using validated patient-reported questionnaires. Results: A total of 229 patients were enrolled, of whom 156 (68%) had at least one skin reaction. The prevalence of cutaneous adverse events was higher for SC DMTs (75-82%) compared to IM DMT (41%) (P < 0.001). Erythema and lipoatrophy were the most common skin reactions, observed in 156 (68%) and 45 (20%) patients, respectively. Dermatology-specific, but not generic, QoL was significantly lower among patients with skin reactions compared to those without. Conclusions: The prevalence of cutaneous adverse events was high in long-term DMT-treatment. Patients with cutaneous adverse events had a lower perceived dermatology-specific QoL.